5 Dec: Industrial meat and dairy production is one of the highest contributors to forest loss, and to climate change at 14.5% of global greenhouse gas emissions, according to a new report launched today by the Global Forest Coalition  at the Convention of Biodiversity in Cancun (CBD COP 13) , Mexico. ‘What’s at Steak? 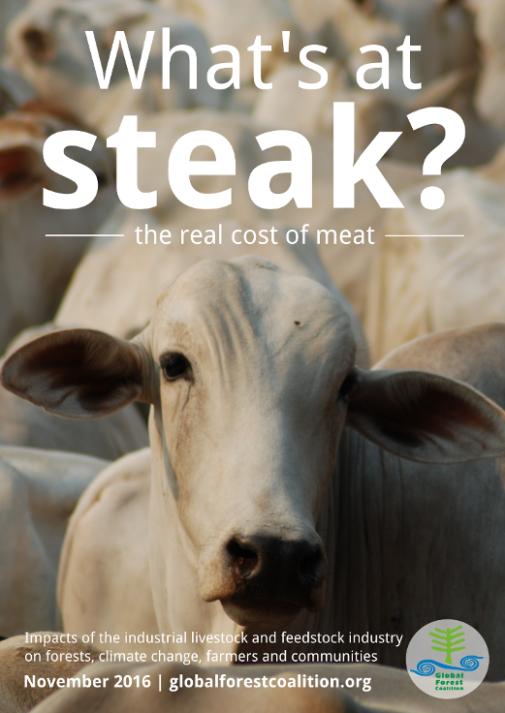 The Real Cost of Meat’  shows on the ground impacts through case studies in five countries—Bolivia, Brazil, India, Paraguay, and Russia. It presents concrete recommendations for policy makers. “The Convention on Biodiversity meetings are supposed to be about mainstreaming biodiversity, but it will be futile unless the livestock sector is included in all relevant UN agreements. Global demand for dairy and meat is expected to rise by 70% by 2050. This is an unsustainable industry that needs to be overhauled,” said Mary Louise Malig, campaigns coordinator of the Global Forest Coalition, one of the co-authors of the study. The report argues that the industrial livestock production (‘factory farming’) model, including Concentrated Animal Feedlot Operations (CAFOs), and large-scale cattle ranching for beef are unsustainable, and are a leading cause of deforestation. In South America, home to the world’s most precious tropical forests, 71% of deforestation in the region has been driven by demand for livestock products, says the report . Beef and dairy are also the worst climate offenders, causing 41% and 20% of the total livestock sector’s emissions respectively. Up to half of Brazil’s greenhouse gas emissions are estimated to come from cattle. Emissions from cattle rearing are similarly high in Bolivia and Paraguay. The report highlights the large scale of industrial livestock operations, and argues that governments are currently supporting these with “perverse incentives”. Instead, the report calls on governments to support and promote existing alternatives to the factory-farming model including agroecology, agroforestry, and extensive traditional pastoralist practices. Changing consumers’ eating habits is also crucial. “Modifying diets is a sensitive issue, but recent research shows that eating less meat and dairy could make a major contribution to protecting the world’s forests and climate— it could help to halve livestock emissions by 2050 for example,” said Mary Louise Malig . The thirteenth meeting of the Conference of the Parties to the Convention on Biological Diversity is taking place in Cancun, Mexico from 4 – 17 December 2016. As guided by the CBD Strategic Plan for Biodiversity 2011-2020 and Aichi Targets, State Parties are mandated by the CBD to mainstream biodiversity, that is, to integrate the conservation and sustainable use of biodiversity into key sectors and policies, for example, in the primary sectors of agriculture, forests and fisheries. In the terminology of the United States Environmental Protection Agency (EPA), a Concentrated Animal Feeding Operation (CAFO) is an animal feeding operation (AFO) that (a) confines animals for more than 45 days during a growing season, (b) in an area that does not produce vegetation, and (c) meets certain size thresholds. Perverse incentives are in the form of policy support towards large-scale industrial programs in agriculture, forestry or fisheries that threaten biodiversity. The Strategic Plan of the CBD calls on countries to remove or redirect such perverse incentives before 2020.